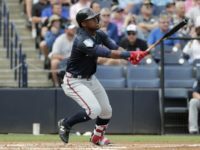 Taking a look around the league, here’s a recap of yesterday’s action and suggestions for your fantasy baseball team. Mr. Clutch (pitcher) – Is it time to sit down and have the “is Patrick Corbin for real?” talk because, again, he went out and dominated the Rockies? Corbin went eight innings, allowing just one earned run while ringing up 10 Ks. He was the best of the best on a day that featured Clayton Kershaw, David Price and Jered Weaver, to name a few. Back to Patrick Corbin. All of Corbin’s numbers have been screaming sell, sell, sell; yet, here we are, a week into July, and Corbin is 10-1 with a 2.40 ERA and 0.98 WHIP. Mr. Clutch (hitter) – Rajai Davis filled up the stat sheet yesterday, going 2-for-4 with a home run and a stolen base. Ever since Toronto has unleashed Davis, fantasy owners have reaped the benefits even with him slowing down a bit last week. Look for more bases to be stolen come this week from Davis. The power is just a bonus. Surprise, surprise! – Detroit who? Michael Brantley just crushed them yesterday. Brantley went 3-for-4 with two home runs and five RBIs, turning into a one-man wrecking crew. While games like this are nice, they come far and few between for young Brantley. For now, he is still a deep mixed league or AL-only kind of guy. Here comes the heat – David Price was simply awful the first half of the season, and then he was on the DL for a month and a half with some mystery triceps injury. But now he looks to be back to the old David Price that we all know and love. Yesterday, he went the distance with a one-run complete game against he White Sox. He gets Houston again this Friday, which should translate into another quality start. Left out in the breeze – From time to time, even the best may falter, and that’s what happened yesterday. A blown save by Mariano Rivera. It is only his second of the season, which is simply amazing that a pitcher born is 1969, could still be churning out seasons like this. He’s tied for second with Joe Nathan this season for saves. Yesterday? I wouldn’t worry too much; the leash is quite long for Mo. Castellanos was on fire throughout June, batting .361/.441/.583 with more walks (16) than strikeouts (13). That’s a lot more production than the Tigers got in the big leagues from Andy Dirks (.250/.305/.303) or Avisail Garcia (.229/.269/.292). Prognosis: The Indians won’t go away in the AL Central, and the Tigers could use some help from Castellanos, who also could spell Victor Martinez at DH. Castellanos has made the necessary improvements in terms of power and plate discipline and has nothing left to prove at triple-A. Bench me, please? – Kris Medlen cannot afford to have bad outings now that Brandon Beachy has resumed his rehab assignment. Medlen went 5.1 innings, allowing seven runs (six earned) off eight hits. With Beachy set to be back sometime after the All-Star break, Medlen needs his next start to be a strong one. He faces the Reds next Friday. I’m benching him for that one. The Streamer – Not a pretty day to be looking for streaming options, but I’m taking Hector Santiago against the Cubs. He burned me last time I picked him, but had a very nice start against the Orioles last outing and looks to be keeping up the momentum today against the cross-town rival. Links of the day – You want links? Well, we got links. Wondered what it would look like if you ranked all 147 pitchers for this week? Then check this out. There was a trade, there were ramifications and this guy breaks it down. Who doesn’t love prospects? Wondering what they are up to? Then check this out. Like Marcell Ozuna? Love Ozuna? Don’t know who he is but need to know? Then check this out. One extra since it is Monday: Don’t forget to check out our own Matt Commins’ week 15 pitching rankings.